More than sixty years ago, when women identified themselves by their marital status, and newspaper help wanted ads placed employment opportunities into separate categories for men and women, a group of more than sixty pioneering women engineers and engineering students gathered to build a national organization. 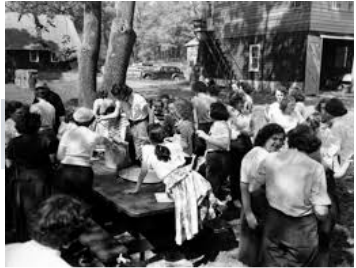 They met in New Jersey, at The Cooper Union's Green Engineering Camp, on May 27-28, 1950 to officially form the Society of Women Engineers, and to make their way into a profession that did not necessarily welcome them. They did so not out of a desire to agitate or to rock the boat, but rather because they wanted the opportunity to develop their abilities, to give expression to their potential, to contribute to society. Groups of women engineers and women engineering students had been meeting informally in New York, Philadelphia, Boston, and Washington, D.C. They understood the value of sharing encouragement and information; of the strength that comes from solidarity with like-minded peers. And they knew that as a group they could accomplish so much more that isolated individuals to make large-scale change, to open the halls of engineering to women. They were women who swam against the tide of their time. When a survey of women engineers was conducted in 1919, there were only 139 known women engineering or architecture students in U.S. history. The labor shortage during the Second World War did lead some women to explore engineering and pursue technical careers. However, when SWE was founded far less than one percent of working engineers were women, many employers remained skeptical of their abilities, and the general public still considered engineering to be a masculine profession unsuitable for women. ​Since its founding, SWE has focused its efforts on introducing young women to careers in engineering, demonstrating to employers and the public the critical role women engineers play in creative teams, and providing support to women engineers as they advance in their careers. The Society of Women Engineers was started in 1950 by women who saw the need for an organization to support and encourage the success of women in engineering. SWE was incorporated in 1952. SWE has grown to over 17,000 members in 90 Sections and 300 student sections. SWE Boston was one of four initial Sections of SWE. The following paragraphs highlight our Section’s rich history of supporting women in engineering. In 1950, SWE Boston's first year of existence, the Section had 10 members (we now have over 350!) One of those charter members, Mary Pottle, is still a﻿﻿ member today. The 1950-1951 SWE "New England Branch" membership listing showed our members had the following employers: Jackson & Mooreland in Park Square, Sylvania Electric in Boston, Lever Bros. in Cambridge, American Resinous Chemicals in Peabody, and Allis-Chalmers in Boston. On Valentine's Day 1951, 9 "girls" met at Northeastern to discuss reorganizing and revitalizing the New England District of SWE, as SWE-Boston was then known. In February 1952, SWE was officially registered as a Corporation in Wilmington, Delaware. In August 1953 Mary Pottle, Section Vice-Chairman (and still a Section Member) wrote a letter to CBS "commending them on their series of programs on engineering and suggesting greater emphasis on women in engineering". The September 1953 issue of the Massachusetts Professional Engineer ran a photo of SWE Boston member Eileen Donohue, with the text "In answer to inquiries as to who is Eileen, the unidentified femme mentioned in VARIETY's Radio Review.... Donohue tossed queries to Bert W. Whitehurst in part one of the 'Romance of Engineering.' Miss Donahue is well known in Boston as the Executive Secretary of the Massachusetts Building Congress." At the September 1954 Executive Council meeting, the possibility of a SWE Student Section at MIT was discussed. By 1955, SWE Boston had 35 members. (There are many SWE Sections now with fewer!) A Section Manual was written in August 1955. The 1955 SWE Achievement Award recipient, Dr. Margaret Hutchinson (Rousseau), was a SWE Boston member and Stone & Webster employee. Her speech at the Convention "stressed the importance of femininity to the woman engineer", according to the minutes of the SWE Boston EC meeting on July 12, 1955. The September ﻿1956﻿ SWE-Boston meeting featured two (male) speakers on the topic "How to Reach the Top". One speaker was a Chemical Engineer professor at MIT, the other a VP at Stone & Webster. Neither speaker mentioned women, all references in both speeches were to "he" and "men", and the Stone & Webster gentleman even referenced the New Testament of the Bible in his talk (as published in the November 1956 New England Professional Engineer). In July 1960, SWE Boston was planning the 1961 SWE National Convention, to be held in June 1961. In September 1962, the boundaries of SWE Boston, which had previously included Maine, Vermont, New Hampshire and all of Massachusetts, were redefined as within 60 miles of Boston, omitting Connecticut. This meant a bit of southeastern Maine, Massachusetts as far west as Athol and Ware, Rhode Island excluding the southwest corner, and southeast New Hampshire including Manchester and Dover, were all part of SWE's Boston Section. An August 1973 meeting at MIT had Dr. Millie Dresselhaus "In the Chair". A September 1973 meeting speaker was the President of the Men's Auxiliary of SWE, or MASWE. In the summer of 1975, SWE voted to allow men to join as full members. That was also the year students became represented on the Council of Section Representatives. On July 18, 1980, SWE Boston's "Terry's Trip" coloring book and a few of our Newsletters were sealed in the Boston Women's Time Capsule at Faneuil Hall, as part of CHOICES! The Women's Expo. The Time Capsule will be opened in 2080 by the Director of the Radcliffe Schlesinger Library, the Mayor of Boston and the Boston Globe. In the summer of 1989, SWE Boston reached 300 members! A "MetroWest Satellite" group of SWE Boston members began planning for meetings around I-495, with the eventual goal of splitting the Section into two Sections. Several meetings were held that year. The New England Shoreline SWE Section was chartered, and about a dozen SWE Boston members in Rhode Island were transferred to SWE-NESS. In 1991, SWE's National Board of Directors met in Boston. SWE-Boston was awarded the bid for the 1995 SWE National Convention. In the summer of 1993, SWE Headquarters moved to its current location at 120 Wall Street in New York City. Planning for the 1995 Convention began in earnest. The 1995 SWE Convention, at the Sheraton Boston, was the BEST SWE CONVENTION EVER! We broke all attendance and fundraising records to date, and the conference featured events such as Networking Night at the New England Aquarium. In 1999, SWE Boston started “regional networking dinners” to reach out to members in all corners of SWE’s geographical boundaries. Dinners (and sometimes lunches) are held almost every month in Southern NH, North of Boston, West of Boston, South of Boston, and in Boston/Cambridge. SWE-Boston hosted the Region F 2000 Conference at Raytheon in Lexington. This Conference celebrated both SWE’s and SWE-Boston’s 50 Year anniversaries. The Conference banquet featured a panel of charter and long-time members, who recounted their experiences in SWE and how times have changed. In 2001, SWE began the transition of Headquarters from the New York location to Chicago. In 2002, Boston-area student sections at Suffolk and Merrimack were deactivated. In 2003, the newly-formed Frank W. Olin College of Engineering started the process to charter a student section. Janice Rossbach appeared at this meeting to show the students that senior engineers were not unheard of, that they were not alone. A group of SWE members in NH has been meeting and holding events since the spring of 2005. They have decided to charter a new SWE section in southern NH. The group consist of present SWE Boston section members and members at large (MALs) who live in southern NH as well as interested non-members. The Southern New Hampshire (SWE-SNH) section was chartered on May 2008. SWE Boston continues to be the one of the largest SWE sections, and one that offers some of the best professional development, outreach, networking, and social programs. We hope you can be a part of SWE-Boston’s great history!